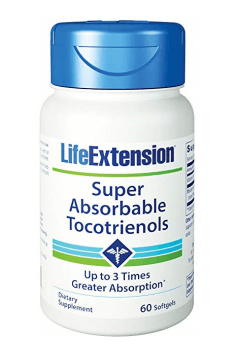 Life Extension Super Absorbable Tocotrienols is a top quality supplement containing a blend of d-alpha-tocopherol and tocotrienols, i.e. compounds known as vitamin E. The product has an antioxidant effect; it helps to regulate the glucose and lipid metabolism and strongly supports the cardiovascular system. Vitamin E refers to a group of fat-soluble chemical compounds divided into tocopherols and tocotrienols. Both groups show greater or less antioxidant properties, and are structurally similar – the difference lies in a single or double bond in the side chain. Tocotrienols, a group of compounds with unsaturated bonds in the side chain; they show up to 3 times higher absorbability and greater antioxidant potential than tocopherols present in regular supplements. Tocotrienols contained in this preparation have been obtained from the oil of the red fruits of Elaeis guineensis palm as a part of the patented mixture EVNol SupraBioTM. It has been thoroughly tested for bioavailability and effective replenishment of vitamin E deficiencies. The ongoing research continually provides new information on these rare compounds that may become an important part of the treatment and prevention of many civilization diseases. The group of compounds referred to as vitamin E has a unique antioxidant potential. This means that the vitamin protects the cells against the action of free radicals, i.e. highly reactive compounds that are capable of damaging lipids, proteins, and nucleic acids. Their high concentration causes oxidative stress, which may result in DNA damage, tumorigenesis or cardiovascular disorders. The role of antioxidants is to reduce the number of free radicals in the body, which both reduces the risk of occurrence and relieves the symptoms of many diseases. In studies, tocotrienols showed numerous anticancer properties. It was observed that these substances, for example, inhibited the development of pancreatic cancer in mice and significantly reduced the incidence of other cancers in humans. The antitumor action of tocotrienols is based on preventing mutations of the nitrogenous bases of DNA, which are the main reason for the formation of cancer cells. What's more, compounds from the group of vitamin E may positively affect cells with damage to genetic material, as a result of which they pass on the pathway of apoptosis, that is the process of programmed cell death. hence, tocotrienols and tocopherols are able to inhibit the development of tumors and support the attempts of removal of the existing ones. Tocotrienols have an unusual ability to inhibit the production of cholesterol, resulting in the reduction of the possible excess of lipids in the blood. The right amount of cholesterol in the blood is particularly important in the era of obesity, atherosclerosis, hypertension, and diabetes. As to counteract these conditions, patients take drugs called statins, which show a cholesterol-lowering effect, similar to that of tocotrienols, except they are much more invasive. Though, using two different mechanisms, the effect of both substances is achieved by blocking the HMG-CoA reductase enzyme. Tocotrienols reduce the amount of homocysteine, an amino acid whose small amounts are necessary for human life, but its excess – quite often –damages the blood vessels. Elevated levels of homocysteine ​​increase the risk of atherosclerosis, thrombosis and consequent heart attack. The high level of this amino acid was also correlated with fewer survival chances after the cardiac incident. Tocotrienols also display anti-aggregation effect themselves, which means that they counteract the formation of blood clots, minimizing the risk of a heart attack or stroke. Interestingly, in one animal study, the induced myocardial infarction inflicted less ischemic damage in the hearts of rabbits that were supplemented with vitamin E.
Studies have shown that tocotrienols are able to increase the sensitivity of cells to insulin, thereby reducing the amount of glucose circulating in the blood. This is an invaluable benefit in the era of ubiquitous simple carbohydrates and saturated fats, which impair the kinetics of glucose uptake and cell reactivity to insulin, leading to type II diabetes. Therefore, supplementation with tocotrienols may be beneficial for people struggling with insulin resistance of the tissues or type II diabetes. Athletes are one of the groups with specific needs who require individual consideration. Due to daily exposure of the body to a stressor, as an undoubted example of which is the physical effort, an intensively training person must take into account almost constant occurrence of inflammatory conditions in the muscles and sometimes also in the joints and bones. The strong anti-inflammatory properties of tocotrienols may help to reduce post-workout soreness and accelerate the regenerative processes of the body. In summary, Life Extension Super Absorbable Tocotrienols is an advanced supplement containing d-alpha-tocopherol and tocotrienols derived from the patented EVNol SupraBioTM blend. The preparation helps to reduce the impact and amount of free radicals in the body. The tocotrienols contained may be the solution in searching for an effective component of the prevention of most civilization diseases. Take one softgel twice a day with or without food. The preparation is aimed at people who want to take care of the condition of their body by reducing inflammation and those who are worried about the deficiency of vitamin E.
The supplement should be consumed in the company of high-fat meals because fat improves the absorption of active ingredients. To enhance the antioxidant effect of the preparation, it is worth to add vitamin C, vitamin A, alpha-lipoic acid (ALA) or N-acetyl cysteine (NAC) in the supplementation. Palm oil, gelatin, glyceryl caprylate/caprate, glycerin, purified water, polysorbate 80, caramel color. A mixture of different iodine forms, including molecular iodine; conducive to maintaining cellular health.